486 3rd street Beaver, PA, 15009, United States. Natural Should Mean, Well, Natural, Natural Soap. Natural Soap Should Mean Natural, Shouldn’t it? Did you know that in the United States, the term “natural” often used on skin care products that contain little or no actual “natural” ingredients? At , when we say “natural” we mean “natural.” Plain and simple… We only use food grade ingredients in all of our Natural Soap. The Ingredients are not bleached, deodorized or refined, just natural, food-grade vegetable oils. The Sodium Hydroxide is Food Grade. Many soap manufacturers use cosmetic grade oils… You wouldn’t want to cook with cosmetic grade oils, so why put them on your skin? Did you know that the FDA does not review cosmetic products before marketed to consumers? There are ingredient requirements, but it is left to the manufacturer to verify compliance. 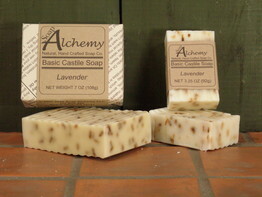 Soap Alchemy lists every ingredient that goes into the batch on each bar of soap we produce. We do not use any ingredients that we would put on our skin. There are no additives such as Sodium Lauryl Sulfate, or it’s cousin Sodium Laureth Sulfate which is notorious for drying the skin. We don’t use fragrance oils in any of our soaps, just pure, natural essential oils and we see no purpose in using any colorants, natural or otherwise, in any of our products either. Soap Alchemy uses food-grade ingredients, essential oils, no synthetic fragrance, no colorants, no dyes! Since everybody is different, you will find between 40 and 50 different varieties of soap on our website. For those who prefer no scent, we make about ten different soaps that contain no essential oils or scent masking chemicals, which you may find in some “fragrance-free” products, so you can choose the soap which is the best for your skin type. Our Pure Castile line of soap uses only 100% Extra Virgin Olive Oil as the base oil for the soap. The Basic Castile line of soap, which includes our Oatmeal Soaps containing Certified Gluten Free Oatmeal, uses a blend of Soybean, Organic Extra Virgin Olive, Organic Palm Kernel Oils as well as Organic Palm Oil, Organic Cocoa Seed Butter and Organic Jojoba Oil. Our Goat Milk Soaps contain Soybean, Coconut, Babassu and Organic Jojoba Oils, Organic Cocoa Seed Butter and Goat Milk. Our Specialty Soaps offer entirely different blends of food grade, natural vegetable oils in each different bar to allow more choice in the oils which go on your body. Our Shea Butter Specialty Soap contains 35% Organic Fair Trade unrefined Shea Butter! We also offer Neem and Tea Tree, Hempseed with Rosemary, Baby Almond, Avocado with Spearmint and Sunflower Oil Soap in this line. Soap Alchemy Soaps, except for our Goat Milk line of soap, are Certified Vegan! What you do get is a pure soap that rinses clean away and is good to use on your hands, face and entire body! We even have customers who use it on their hair! Be Good to Your Body, Be Good to the Earth. Our bars of soap not only claim to be natural, but they are also safe for the environment. From the paper we use to package it, to our display boxes, our marketing materials and the inks used in our printed materials, you can bury it in the ground, and it will break down naturally leaving nothing behind to harm the environment. Our wrappers and marketing materials, printed with American soy inks on 100% recycled paper, our boxes are made with FSC Certified paperboard, printed with linseed oil inks. Our soaps use all natural, earth-friendly ingredients. Soap Alchemy sources as much ingredient and packaging from the USA as possible. But, it is not always possible. For example, Tea Tree oil is from Australia. However, Orange Essential Oil is from America! The paper we print on, made in Michigan, the ink we use to print is also American Made. The plastic jars, lids, labels, ink, shrink-wrap, all made in the USA. Soap Alchemy strives to source American where ever possible. For example, Sugar, from America, Sodium Hydroxide, a critical ingredient in Soap, made in America. Make a positive choice, help us to build a better, healthier America. Article Headline: Natural Soap should mean, well Natural Soap, Natural Moisturizing Soap Article Description: What Ingredients should be consider for a Natural Handcrafted Moisturizing Soap? This entry was posted on Sunday, May 9th, 2010 at 6:31 pm and is filed under Chemistry, Featured Ingredient, Ingredients and your body, What we do. You can follow any responses to this entry through the RSS 2.0 feed. You can skip to the end and leave a response. Pinging is currently not allowed.